Today I have a fun shaker card to share with you. Shaker cards are always fun and it's even more fun when you can find creative ways to create them. Coordinating dies certainly open up the possibilities for shaker cards. 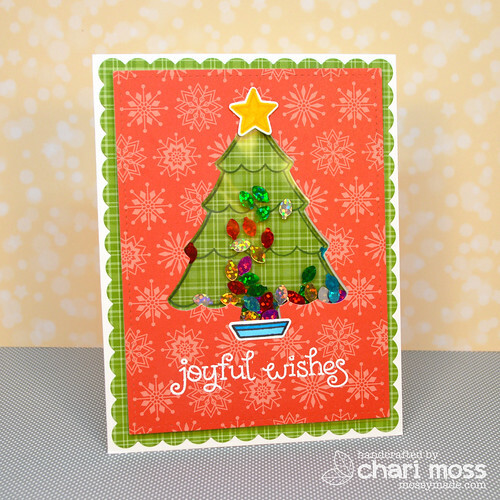 I used the tree die the coordinates with Trim A Tree to cut out the window of my shaker card. 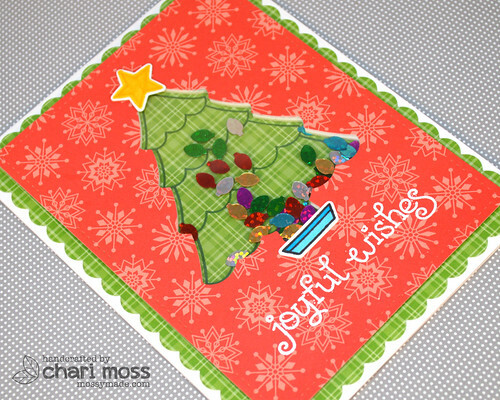 Before assembling the card I lined up the pieces and stamped the tree inside the die cut window onto the green paper. I also used white craft foam to create the pocket for the shaker pieces so I was able to die cut it with the tree die as well and have an opening that matched exactly allowing the shaker pieces to stay within the tree all the time. The sentiment is embossed in white embossing powder and I added just a few elements to the tree to finish it off. I wanted to keep the tree itself simple so that the little light bulb pieces were easily seen. The shaker pieces are from a pack of shaped glitter I found at Michaels. Any glitter, sequins or shaped confetti would work to decorate the inside of the tree.